In this pack, you will find all the photocard materials needed to run a successful Spanish mock spea.. 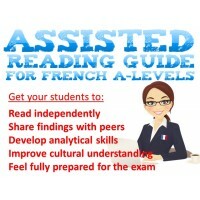 In this pack, you will find 72 high quality discussion cards for the new AQA French A-Levels based o.. In this pack, you will find 120 high quality photocards for the new AQA French GCSE on all the 12 to..
Have you ever wondered how to get your students to improve their cultural understanding of the Frenc.. This is a great game to play with your students from any years in order to practise numbers in Frenc.. Here I am sharing with you a set of 3 lessons that lead to speaking peer assessment on parts of the .. In this pack, you will find 18 high quality discussion cards for the new AQA French A-Levels based o.. In this pack, you will find 10 high quality photocards for the new AQA Spanish GCSE on one of the 12..